Sewing machine – check. Thread – check. Material – check. OK you’re ready! Seriously that is all it takes. 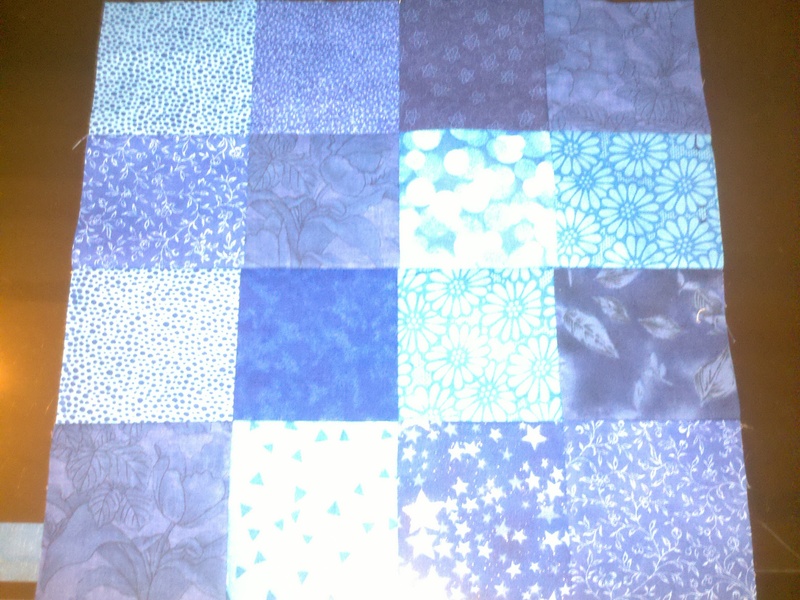 This example is for a random patchwork quilt. If you want to get complicated and paper piece to have precise 24 point stars, go for it. If you want to make a quilt from some pretty pre-cut squares, it is really easy. Really. Easy. OK, back to easy. If you purchase a sampler pack of squares, or a charm pack, you will be given some number of squares that all match somehow, already cut to one size. To calculate the size of the quilt you will end up with from that bundle, measure one square (let’s say it’s 4.5 inches square), minus .5 inches for seam allowance (each seam requires .25 inch material for seam allowance). Ok so 4″ is your finished square size. How many squares are there? Let’s say there are 50 squares. So you could make a quilt 7 squares across by 7 long, or 6 across by 8 long. Those options would bring you a 28″ square quilt (# squares times inches per finished square), or a 24″ x 32″ quilt. Might work if you know someone having a baby, but if you want it to cover your lap, you may want to buy 2 of those packs or more (in our example case here). You can always add a border at the end to stretch out your length. Next step. Take two squares, put the right sides together and match them up so the edges are straight. Sew them together in as straight a line as you are able, with .25 inches seam allowance. There’s a little line on your hopper foot on the sewing machine where you can line that up. Again, keeping it easy. No need to backstitch, the seams will interlock as you go. Now before you go pulling your stitched squares out of the machine and cutting off the thread tail, STOP. Let it sit there, because you’re going to chain sew. Huh? OK so you sewed a seam. Well, match up another two squares and give your machine pedal a tap to let it have a few ’empty’ stitches and then stick your next set of squares under the foot and sew them together! You’ll just have a little thread connector between your square sets. As long as your number of squares across is an even number, you can continue to do this step until you run out of squares. When you are done, snip the threads between your square sets and get over to the ironing board. Yes, you really do have to press the seams. Open, to one side or the other, doesn’t matter. 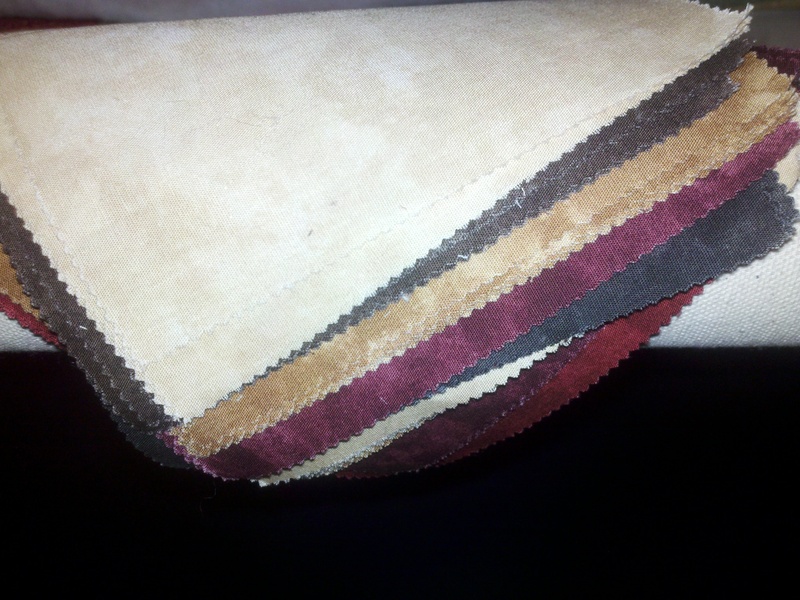 Generally I do it towards the darker material, but just make the seams flat. Once you get through all of your square sets, it’s time to make some more seams! Go back to your machine and sew! If you want to sew long rows of squares that match your final length, do it! If you want to sew square blocks of 4 squares and then sew them together, do that instead! Everyone has a method, and everyone has an opinion as to how it SHOULD be done. Do it how YOU want to do it, and you will find the method that works best for you. Just know that you need to iron your seams flat prior to moving on, and if you have a seam that went wrong and is obviously crooked, pull out the stitches and resew it. You’ll be happy you did. Note in the photo below that the corners of the squares match up. May take you a little practice to get there, but ironing, and watching your seam allowances will most definitely help! This is really all it takes to make a quilt top. You can add a border of any size or not. 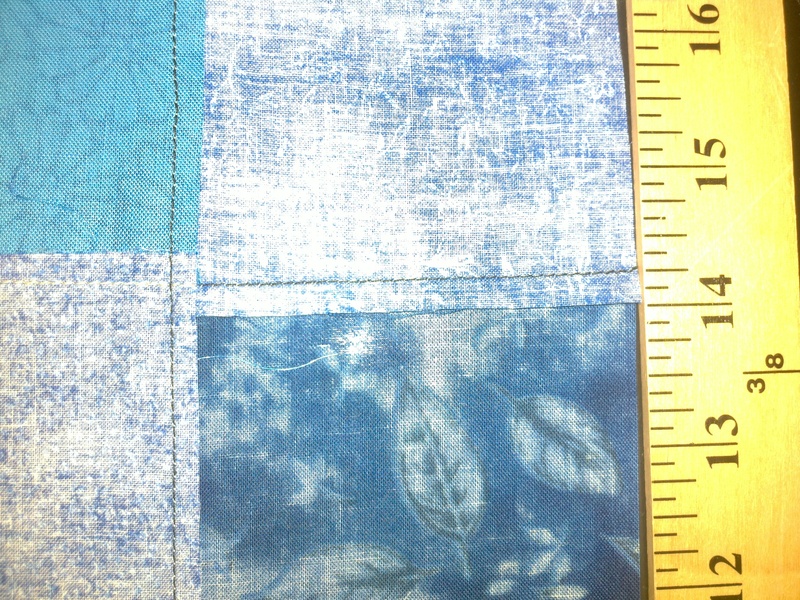 This entry was posted in quilt preparation and tagged easiest quilt, easy quilt, first quilt, how to make a quilt, how to make a quilt top, quilt making, quilt top, simple quilt. Ya that would definitely slow things down a bit!! Remove yourself of any deadlines (if you have one for it, other than 2035 :)) so you enjoy it rather than feeling it’s a burden!